War Resisters League condemned in the strongest terms Symposium on Islamic Terrorism held on August 24th and 25th in San Diego, hosted by the California Association of Tactical Officers (CATO). 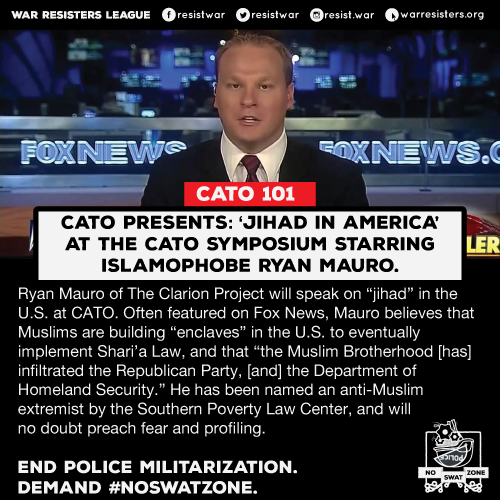 The epitome of a growing culture of fear increasingly relied on by policing, this symposium featured infamous anti-Islam conspiracy theorist Ryan Mauro as their top presenter. Ryan Mauro is designated as an "extremist" by the Southern Poverty Law Center for advocating for profiling of Muslims, amongst other alarming positions. On August 18th, the Council on American Islamic Relations sounded alarm bells when Mauro - analyst with the Clarion Project - was announced keynote speaker, urging San Diego Police Department to "ensure that SDPD personnel are warned of the conspiracy theories promoted by the featured speaker, that no taxpayer dollars go to pay for attendance and that any officer who attends in his or her private capacity does not receive continuing education credit.” Even breitbart.com, a site very sympathetic to Mauro's harmful worldview, was compelled to note the opposition. As Ali Issa of WRL noted: "This convergence of the SWAT teams which the CATO trains regularly with hate profiteers such as Mauro and Clarion, regenerate the violent and racist actions we see from the police everyday." End these so-called "trainings" now!